I've had a secret since late last year which has been very difficult to keep. 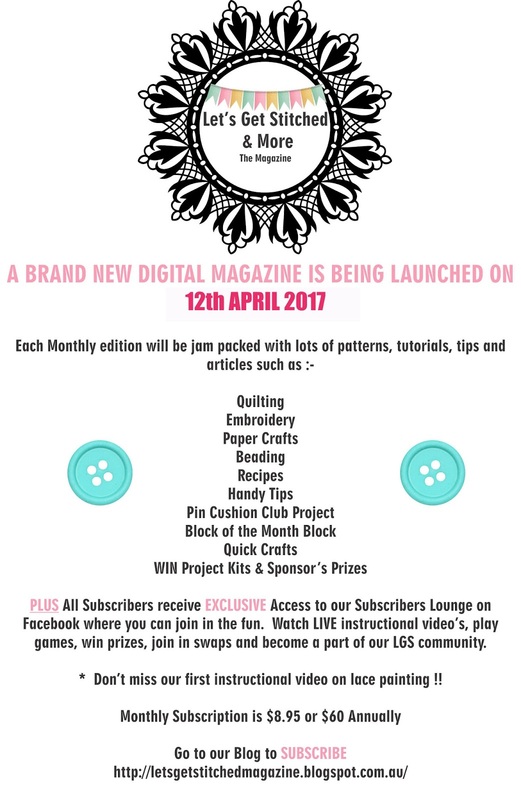 2 of my closest friends and I have joined forces to produce a monthly digital magazine which will encompass all types of crafts including Quilting, Sewing, Embroidery, Paper Crafts, Beading, Upcycling and much much more. I have so much to show you but that can wait for another blog post. It was important to us to have at least a couple of issues under our belt and ready for publication before we made the BIG announcement which we did last Sunday at our annual Lets Get Stitched Retreat ! My illness is unpredictable so I have to be super organised. I have quite a number of projects in each issue. This is the first of mine for the APRIL Issue. Most projects in every issue will have kits available in our online store and also supplies that are not readily available in your local store. This project is a very simple vintage style collage designed to be framed. 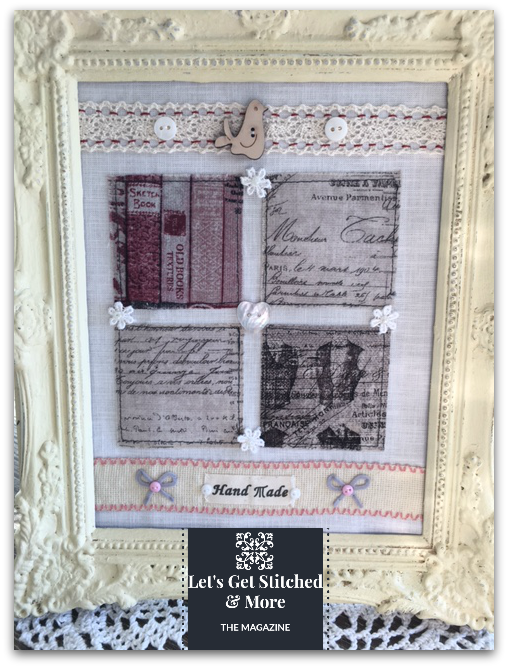 It features VINTAGE style fabric, lace, buttons and a hand painted birdy button. It's suitable for ANY skill level. 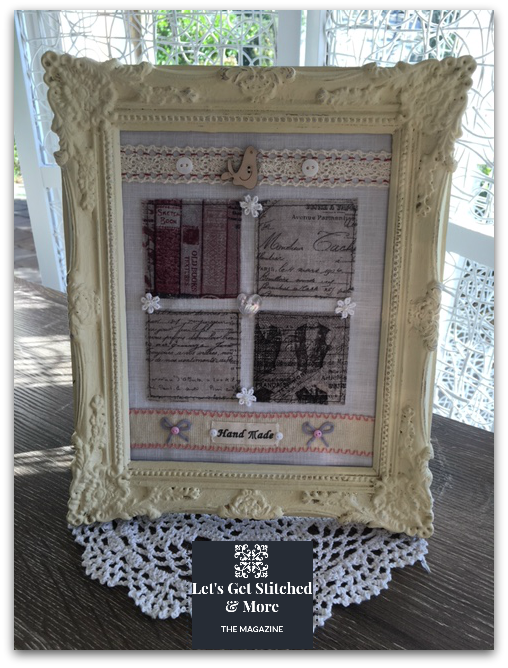 I framed it in an upcycled frame which I painted with Chalk Paint. 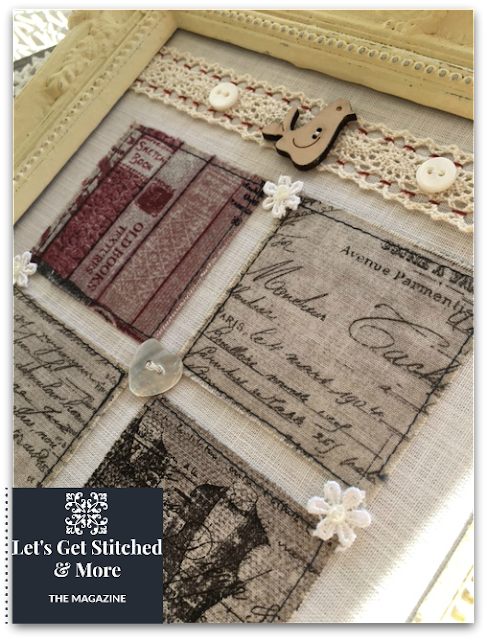 Next Blog Post I'll show you another of my projects and also the new Stitchery BOM of mine which will feature in the magazine for the next 9 months. It's all finished and just in the process of being put together ready for photographing. It has a little touch of applique as well which gives it an extra special pop. I also have to confess that I have another couple of secrets as well....... All will be revealed really soon. How exciting for the three of you! Looks awesome!